While almonds are often classifies as nuts, and even sometimes as dry fruits, in reality they are neither. In fact, almonds are a seed. Almonds, at least the ones that we are commonly used to, are the shelled seed of the almond tree. They are also often sold unshelled. This shell is actually called a hull, which is a ‘reticulated, hard, woody shell’, similar to a peach pit. Actually, almond trees are scientifically classified as part of the same subgenus as the peach, meaning they are close family. So, the almond seed is covered by the hull, which in turn is covered by the almond fruit. The fruit is grey-green in color and has a thick leathery texture. While the fruit is edible, it is not that popular. The stripped and shelled seed is where the money is. It is commonly eaten as it, or roasted and salted. However, a variety of products are also created from it, such as flour, oils, extracts, essences, etc. Almonds are also used in many foods and desserts around the world. 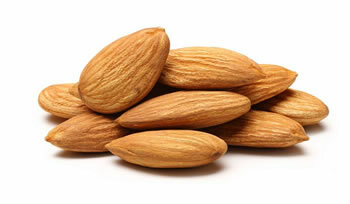 Also, a less known fact about almonds: Wild almonds are bitter and contain cyanide. Eating too many of these wild almonds can be fatal. However, the ones that are commonly available are the domesticated sweet almonds. Still it does not mean that there are no side effects to them, but worry not as the benefits greatly outweigh the side effects. Also, the side effects are mainly applicable by consuming large quantities of almonds. Contain lot of minerals, as well as vitamin E, calcium, magnesium, potassium, riboflavin and niacin. Almonds are rich in magnesium, but too much magnesium can lead to drug interactions, especially with laxatives, antibiotics and certain blood pressure medications. Excess in Vitamin E can lead to diarrhea, flatulence, blurred vision, headaches and dizziness, and lethargy. Almonds are prone to bacterial growth; harmful bacterial growth can lead to health problems if consumed without proper cleaning.